The stated goal of Santos’s meeting with President Obama is to explore the possibility of reviving an Alliance for Progress-like program for Latin America, and to discuss issues related to “citizen security, respect for human rights, and economic prosperity.”  The Colombian daily Semana is also reporting that Santos will take up the matter of increased U.S. assistance in transitioning to what is hoped to be a post-conflict period for Colombia. Santos, who announced on November 20 his plans to run for re-election in Colombia’s upcoming May 2014 elections, has had his tenure as president defined by security issues, culminating in ongoing peace talks with the FARC (Fuerzas Armadas Revolucionarias de Colombia; Armed Revolutionary Forces of Colombia), which began in November 2012 and have yet to be concluded. While Santos’s dedication to advancing the peace process is admirable, he must take further action towards protecting labor leaders and punishing white-collar criminals if he wants to move Colombia towards greater stability, growth, and good governance. To date, the negotiations have not proceeded at the pace Santos had wished for, leaving doubt as to whether this 50-year-old conflict can finally be ended before the 2014 elections. While the deadline for concluding the talks was November of this year, at this point the only issue that has been settled is that of political participation, although some progress has been made on the matter of land reform. The two sides are still at work on the remaining points, now turning to the drug trade, an issue on which the FARC have taken a pro-reform stance. Most frustrating is the fact that any deal reached by Santos would not actually be binding for all of the FARC. As Colombia’s RCN La Radio reported, some of the FARC’s separate factions have indicated that they will not abide by any peace agreement. While both Santos and the FARC negotiators in Havana have dismissed these reports, any indication that the armed group’s negotiators do not speak for the entire group could be disastrous to the peace talks. As COHA analysts have argued in the past, while a peace deal could be achieved between the Colombian government and the Secretariat (the FARC’s leadership committee), it is difficult to believe that all of the FARC’s fighting forces will agree to demobilize. Santos must also take steps to reform the country’s oversight mechanisms, mainly the Financial Superintendence, in order to avoid a repeat of 2012’s Interbolsa scandal, in which the giant firm, through risky business practices, found itself defaulting on loans from Spanish banking group BBVA. The fall of this company, which at its height controlled 27 percent of Colombia’s stock market, revealed serious flaws in the country’s regulatory institutions. Financial Superintendent Gerardo Alfredo Hernández was fired on November 28, but Santos must take further steps to protect the Colombian economy from future financial misadventures such as the Interbolsa affair. 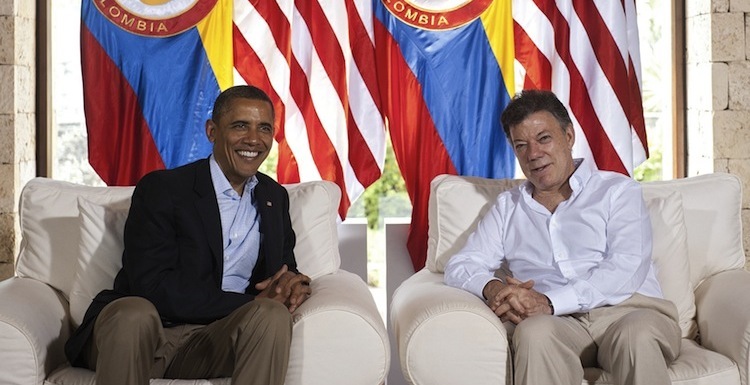 This may be the last time that Santos meets with President Obama before the 2014 elections, and the Colombian head of state, with a mere 33 percent approval rating as of November 1, could certainly use some public relations victories abroad in order to improve his image at home. For Santos to cement his reelection chances he must drive through a successful conclusion to the negotiations with the FARC, address and put an end to the rampant violence against labor and environmental organizers, and ensure that these giant financial corporations are following the law. “Juan Manuel Santos seeks re-election as Colombia’s President.” The Guardian. November 20, 2013. Accessed December 2, 2013. http://www.theguardian.com/world/2013/nov/21/juan-manuel-santos-re-election-colombia; “Colombia: Santos Begins Race Looking like the Winner.” Latin News, November 28 ,2013. Accessed December 2, 2013. “Colombia: Some FARC units ‘reject peace deal.’” Latin News. November 27, 2013. Accessed December 2, 2013. “Colombia: Heads to roll over Interbolsa Scandal.” Latin News.